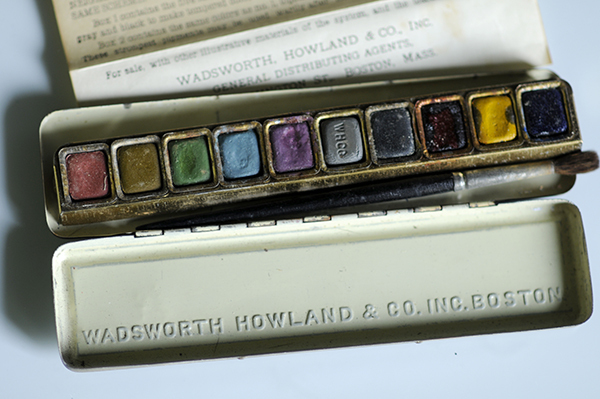 The Munsell Water Colors were created around 1914. The set contains 10 scientifically measured colors inside metal tins along with a No.7 camel hair brush and info sheet all tucked inside a metal case with a color sphere printed on the top. The sets were intended as an aid for art educators to teach the basics of color theory and could be accompanied by other teacher aids like the crayons, charts and color tree. It cost 50 cents, the equivalent of $9.31 today. Below is the text found on the info sheet included in the set. 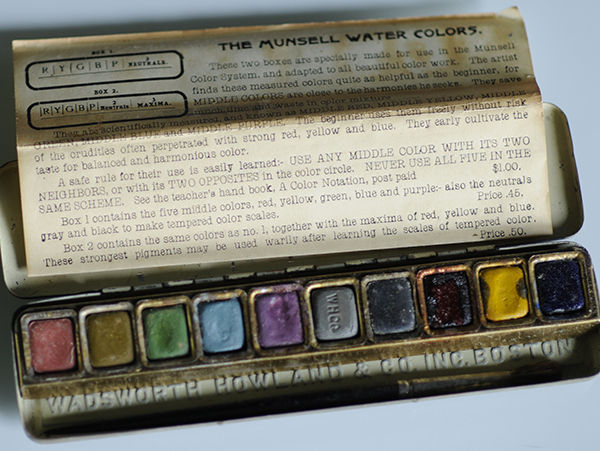 These two boxes are specially made for use in the Munsell Color System, and adapted to all beautiful color work. The artist finds these measured colors quite as helpful as the beginner, for MIDDLE COLORS are close to the harmonies he seeks. They save much time and waste in color mixture. They are scientifically measured, and known as MIDDLE RED, MIDDLE YELLOW, MIDDLE GREEN, MIDDLE BLUE and MIDDLE PURPLE. The beginner uses them freely without risk of the crudities often perpetrated with strong red, yellow and blue. They early cultivate the taste for balance and harmonious color. A safe rule for their use is easily learned: USE ANY MIDDLE COLOR WITH ITS TWO NEIGHBORS, or with its TWO OPPOSITES in the color circle. NEVER USE ALL FIVE IN THE SAME SCHEME. See the teacher’s hand book, A Color Notation, post paid $1.00. Box 1 contains the five middle colors, red, yellow, green, blue and purple: also the neutrals gray and black to make tempered color scales. Box 2 contains the same colors as no. 1, together with the maxima of red, yellow and blue. 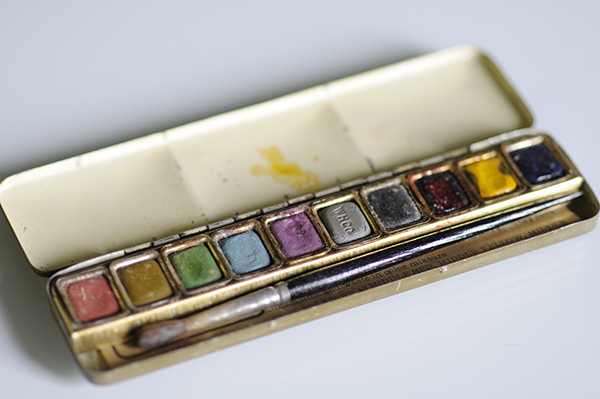 These strongest pigments may be used warily after learning the scales of tempered color. Price .50. 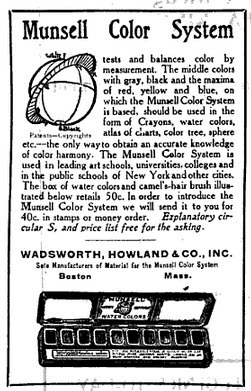 For sale, with other illustrative materials of the system, and the teacher’s handbook by Wadsworth, Howland & Co., Inc. General Distributing Agents, 82-84 Washington St., Boston, Mass. Favor, Ruhl & Co., 423 Wabash Ave., Chicago, IL., Western Agents. 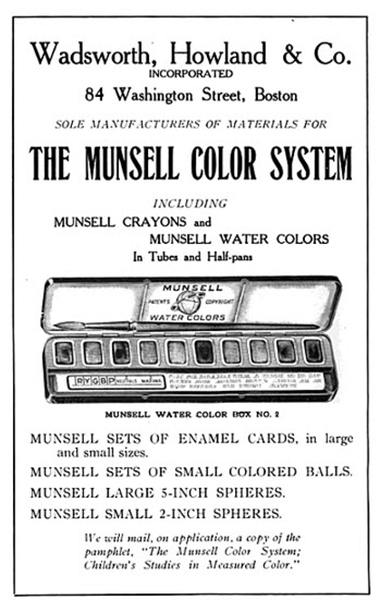 At the time of the release of the Munsell Water Colors, advertisements for the sets and the color system appeared in many educational publications. The ad above shows the other teaching tools that can accompany the Water Colors including cards and color spheres. 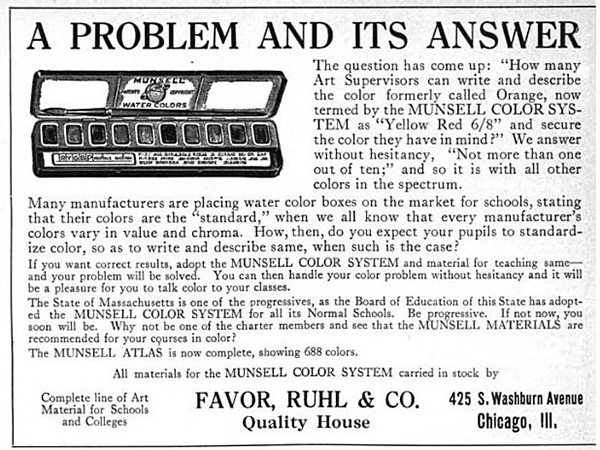 Teachers can also request a copy of “The Munsell Color System: Children’s Studies in Measured Color,” especially designed to help children learn the subtleties of color. 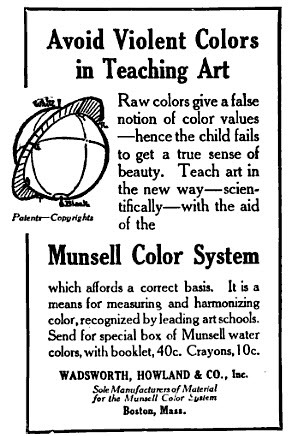 The scientific and harmonious approach to teaching color to children was incredibly important to Albert Munsell. In the ad above, we see the evidence of that messaging when it says to, “Avoid Violent Colors in Teaching Art,” to help a child, “get a true sense of beauty” in color. As Regina Blaszczyk put it so well, Albert was, “A tastemaker, and he felt that the bright new colors that were created by the synthetic dyes and pigments were not in good taste. He wanted to see subtle hues that had grey in them; he appreciated subdued colors.” You can see all this reflected in the Munsell Water Colors. 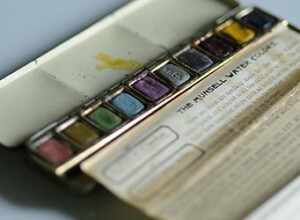 If they don’t make this anymore, could Munsell share which pigments were used in establishing the Munsell color system?